The US and other world powers have said they are ready to arm Libya's UN-backed unity government to help it fight the self-styled Islamic State (IS) group. Speaking in Vienna, US Secretary of State John Kerry said world powers would back Libya in seeking exemption from a UN arms embargo. He said IS was a "new threat" to Libya and it was "imperative" it was stopped. Last month, the Libyan government warned that IS could seize most of the country if it was not halted soon. After holding talks with international partners, Mr Kerry said: "The GNA [Government of National Accord] is the only entity that can unify the country. It is the only way to ensure that vital institutions... fall under representative and acknowledged authority. "It is the only way to generate the cohesion necessary to defeat Daesh [IS]." Can unity government restore stability? The requested arms embargo "exemption" for Libya will need to be approved by the UN Sanctions Committee before it comes into force. But the Libyan government's formal request for it signals that they have been given assurances that it would soon be approved. Libya remains a country where multiple administrations are still bickering over who is in charge. Armed groups in western Libya, reputed for their shifting allegiances, only loosely back the new government, and there is no clear chain of command. There is a risk that future arms shipments will either fall into the wrong hands, or exacerbate the civil conflict there between rival militias. Mr Kerry said support for arming the government was part of a package of measures agreed at the meeting, which included accelerating non-military aid to Libya. He said that as well as countering IS, the GNA should take full control of Libyan ministries, backed by the international community. A joint statement from the countries attending drew attention to Libya's role as a major transit point for migrants trying to reach Europe. "We look forward to partnering with the GNA and neighbouring countries to tackle the threat posed throughout the Mediterranean and on its land borders by criminal organisations engaged in all forms of smuggling and trafficking, including in human beings," it said. "We are ready to respond to the Libyan government's requests for training and equipping the presidential guard and vetted forces from throughout Libya." But the prime minister of Libya's unity government, Fayez Sarraj, warned major challenges lay ahead, saying taking on IS would require further outside help. "We urge the international community to assist us," he said. "We are not talking about international intervention, we are talking about international assistance in training, equipping our troops and training our youths." The North African country has been in chaos since Nato-backed forces overthrew long-time ruler Col Muammar Gaddafi in October 2011. Until recently it had two rival governments competing for power, and there are still hundreds of militias, some allied to IS. 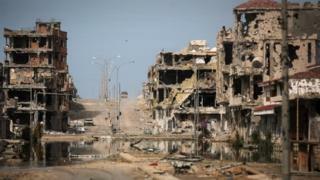 Western nations hope the unity government will take on IS, which has a foothold in Sirte - the home town of Gaddafi. The militant group has launched a series of suicide bombings and attacks on oil facilities in the country. Video Will new UN backed government stabilise Libya? Libya: Can unity government restore stability?